Nutra-Lift , Nutralift, antiaging skin care product, antiaging cosmetic product, antiaging skin care, antiaging product, antiaging wrinkle cream, best antiaging creams, antiaging treatment, antiaging skin cream, cosmecuetical, natural skin care, organic skin care, moisturizing skin care, natural SPF, sun protection factor, acne treatments, acne cures, acne lotions, facial products, cosmetics , personal care, certified organic, younger looking skin, sun block, photo stable sun protection, zinc oxide, sunscreen, polyphenols, anti-oxidants, dmae , vitamin c ester, alpha-lipoic acid, grape seed extract, mango, personal care, seaweed, CO Q10, womans skin care, beauty products, antiaging treatments, cosmecuetical skin care, natural & organic, non-comedegenic, Anti-Wrinkle Skincare, anti-aging Serums, Masks, Lip Renewal Creams, Cleansers, Eye Treatments, Hair Care, Natural Shampoo, Natural Conditioners, Styling Gels, natural hair gel, Shave Cream, Natural Shave cream, Body Care, Moisturizers, Scrubs, Soaps, Foot Care, Cuticle Care, Anti-Cellulite Treatment, mens skin care, mens personal care, hyaluronic acid serum, chocolate body products, organic goat milk, chocolate body lotion, natural organic makeup, organic body butter, certified organic makeup, treatment for sagging skin, firm sagging skin, white chocolate body butter. 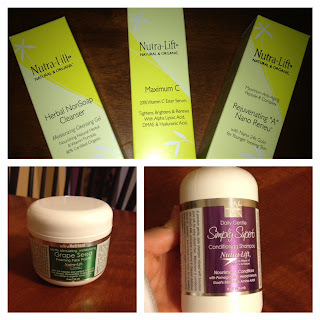 Thank-you Nutra-Lift for sending me several products to test for my review. All opinions are 100% mine and I was not paid for this review. The products that were sent to me include, Simply Superb Nutra-Lift Conditioning Shampoo, Grape Seed Foaming Face Polish, Herbal NonSoap Cleanser, Maximum C, Rejuvenating "A". The Herbal NonSoap Cleanser is a moisturizing gel that is 80% Certified Organic. The Maximum C helps tighten, brighten, and renew skin. Rejuvenating "A" has Nano 24k gold to make your skin looking younger. Simply Superb Conditioning Shampoo nourishes and conditions your hair with pomegranate, herbal extracts, goat's milk and silk amino acids. I always enjoy finding products that are naturally and organically made! 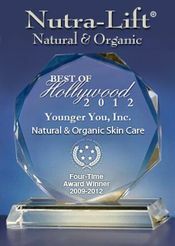 It is fun to try a product that Hollywood uses all the time. The other three products work wonderful together. They each had a bit of a citrus smell and after each use of the product my face felt incredibly smooth... LOVE IT! I am going to continue to use these products and encourage you to try them too. You ouight to bе a part of а contest for one of thee most useful blogs onn thе web. I will hіghly гecommend thіѕ sitе!